A couple of weeks ago, I had to read this graphic novel for my Literature for Children and Young Adults class. I had to do a bit of train travelling that weekend, which is always ideal when I need to read something because there little else I can do to keep myself occupied on a train but read and write. Once I started reading, I didn't want to put it down. The story, the characters, the setting, and the events were just so engrossing. 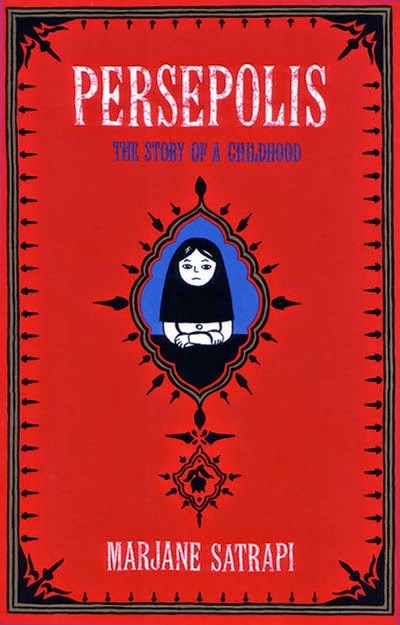 Persepolis: The Story of a Childhood is part 1 of Marjane Satrapi's graphic novel memoir about growing up in Tehran, Iran, during the overthrowing of the Shah's regime, the Islamic revolution, and the war with Iraq. It is a true story about growing up surrounded by conflict in many forms, including forms I hope to never truly understand because of how horrific war can be, and forms that can relate to a universal audience. As well as growing up trying to rebel against regimes and revolutions and wars, we are being presented with a girl as she grows from age 6 to 14, who rebels against her parents and teachers and the never-ending struggle to fit in whilst still being herself: universal issues that a very large audience can relate to. As a memoir, the story is told completely through Marji's young eyes as a strict, violent, and scary world unfolds around her and she learns to understand it. Marji aside, my favourite character was her uncle Anoosh, who told her stories about his life: his involvement in making Azerbaijan an independent state, his time in the U.S.S.R, his failed attempt at smuggling himself back into Iran and the resulting time in prison. He was a brave and honest character who had a great affinity with Marji and they seemed to understand each other more than anyone else in the book. As a result, my favourite part of the book was the sixteen pages where he was present and interacting with Marji. His involvement in Marji's life warmed my heart, and at the end, it took all of that warmth and froze it into a giant ice block and then smashed it on the ground and let it melt. I might have actually gotten a little emotional towards the end of the section with Anoosh, feeling Marji's pain. This graphic novel was set in Tehran, Iran, during a time of great conflict. While I started the book with only a vague understanding of what to expect, I finished the book with a much better idea of what that time and place was like, especially for a young girl. I was taught what I needed to know to understand the book through the comics, and the pictures helped that process along. It was interesting to learn about the place Marji lived at the time she lived there, growing up. I loved Satrapi's style because it was honest and really got into the voice of the character at the different ages she is present at. As a graphic novel, the writing consisted mostly of dialogue in speech bubbles and important narration in boxes at the top or bottom of the frame. Because of this style of writing, we learn and understand things in the text at the same level that Marji does. This is a refugee story in the end, but what makes it different is that it doesn't focus on Marji getting out of Iran, but instead it focuses on the lead-up so that the reader cannot fault the reasons. I love that by making this choice, Satrapi has been able to enlighten the reader about the amount of truth, or lack thereof, in the common stereotypes surrounding the western ideas of what Iranians and living in Iran must be like, smashing many of the common misconception. The other thing that made this book different to other refugee books was that in the end, she didn't have to illegally smuggle herself out of the country and get on a boat all sneaky-like; she just got on a plane and went to Austria and that's only at the very end of the book. While it is a turning point, it's not focused on for chapters and chapters and dragged out. Overall, I just really loved this book. I found it moving and insightful. I take pride in not believing stereotypes and generalities about people from certain place or religions etc, but this book taught me a few things that I didn't know and I can't tell you how much I appreciate it when a book does that. Have you read (or seen the movie) 'Persepolis'? What did you think? I went missing-in-action for a couple of weeks there, so sorry! The past week has consisted of the mid-semester break and after missing the chance to upload this last Saturday, I figured I may as well just wait until this Saturday. Meanwhile, I have been indulging in chocolate, swimming with a bunch of writerly friends, working at the library, and having the unit on res to myself as all of my housemates stayed in their hometowns for longer than I did. Here is the summary of my classes from two weeks ago! This week was the week I workshopped alongside two of my best writerly friends. I was really pleased with the responses I got this week, everyone's pieces were really good and I thought the feedback was useful and very encouraging. This is why I love workshopping in class. I didn't bring in a full first-draft because I wanted to get an idea of whether or not the class thought the subject and the writing was 'literary' (as is required for this assignment) and to get an idea of where a first-time reader would think the story is going if they had to guess. I can't wait to keep writing this piece. Readings: Ode to a Grecian Urn by John Keats, Ode on Melancholy by John Keats, and Adonais: An Elegy on the Death of John Keats by Percy Bysshe Shelley. The reason our teacher wanted us to read these poems was so that he could tell us not to try and write poems like them. Keats and Shelly were the 17th Century romantics, but for our assignment especially our teacher wants us to write about the world as we have inherited it. We took a look at some other poems in class to get a better idea of what our teacher meant by this. It was the small decisions within these poems that made them stand out; the unique use of words, the choice to refer to certain things that probably weren't around in the 17th Century. Good poetry is made up of small decisions. This week we were looking at graphic novels and memoir. The reading, Persepolis: The Story of a Childhood by Marjane Satrapi, is both. We started the lecture by looking at Australia's engagement with Asia, how texts represent Asia, and how they represent Australia. The Australian engagement with Asia is surprisingly manipulated and limited to particular aspects. In Persepolis, the setting is Tehran, Iran, in the late 70s and early 80s. We are told about political, religious, and cultural aspects of the time and place through the eyes of a young girl, between the ages of 10 and 14. Some time next week, I am aiming to write a review for this book, because I really enjoyed it. Persepolis was used as an example of how texts represent childhood and adolescence as developmental stages, that identities are formed in particular socio-economic and cultural contexts, and that identities are formed in particular historical and colonial contexts. This book can be used to compare the representation of class and gender in a particular time and setting. Readings: Home Truths: Revisiting Wake in Fright by K Jennings and Hope Lives Here by G Linnell. This week discussed the use of multiple voices and characters in a creative nonfiction personal essay and some methods of keeping them accurate, specifically the writer's responsibility to do their research and conduct interviews where appropriate. Writers need to research beyond their own means to write competent and true stories. Interviews, especially when conducted face-to-face, are useful for gaining information, observing behaviour, ascertaining opinions, facts, and observations about an individual, and to better understand the story. One of the great things about interviewing somebody is that although you might start with certain questions in mind, if you let them just talk and talk and allow them to go on a tangent while answering the questions you're asking, they might end up giving you information you never considering, stories you weren't expecting, and more material to work with than you could have hoped for. Of course, for this to happen, the interviewee needs to be comfortable enough in the interview setting to open up, which is why it is important to have good people skills and conduct the interview in a place and form that the interviewee is most comfortable with. The interviewer needs to be aware that it isn't an interrogation, but a dialogue, a conversation. After an interview, you might go back to the questions and answers and decide that some of the things you would like to include in your story are not entirely clear, and it is then the writer's job to verify the information and seek clarification, especially if the piece is intended for publishing. However, just as we have to choose certain aspects of ourselves when we write the 'I' in a creative nonfiction piece, we also have to choose certain aspects of the story, otherwise it could become too confusing, too long, too complicated. The things we choose to include and exclude need to make the reader feel (or not feel) the way the writer is trying to make them feel (or not feel) and so that the intended message being conveyed isn't overshadowed or diminished by other things. However, this also has to be done with respect for the other people involved and their wishes. That concludes the week 6 Saturday Summary. I apologise again for going missing in action for a couple of weeks there, I'll try to resurface and visit everyone's blogs again soon! Happy writing, everyone. Did you enjoy your Easter/International Chocolate Indulgence Day? It's that week before assignment due-dates arrive, submissions for the next edition of Wordly have just closed, and I almost feel like I went out of my way to over-commit to this weekend and next week. But here is a summary of the classes I've had this week. This week, and I'm expecting the following weeks to be much the same, was spent workshopping our classmates work for our assignment. For lack of anything else to report about, I'll tell you about the assignment. We have a fiction piece due at the end of the trimester, worth 50% of our overall mark for the class. The piece(s) has to be 2500 words, which is a nice number for word counts if you ask me. Last year, my creative assignments all fell around the 1500 word mark, and I know I was not alone in thinking we were expected to fit too much into those 1500 words. Now with an extra 1000 words to work with, I'm thinking the classes will see some final pieces that are much more filled-out and well-rounded than in last year's classes. I'm scheduled to workshop my own piece this coming Monday, so wish me luck! Reading: My Last Duchess by Robert Browning. This week we were looking at persona, irony, and satire in poetry. The poem set for the reading, My Last Duchess by Robert Browning, was a great example of these things. What's great about poetry as with any writing is that you can speak as anyone or anything. Of course, poetry allows for a little more unquestioned experimentation than other forms of writing normally do. The possibility of who you could speak as in the poem is limitless. An interesting note that came up in class discussion was that it's easy to write characters we don't like, because of the emotions they trigger within us. The irony of this is that a lot of people write poetry in an attempt to capture and immortalise something beautiful and living, something that's always disappearing. Something else that can be included in poetry is pathos: a quality that evokes pity or sadness. I first learned this word when I was studying Drama in high school, as it was a technique we tried to use in our performances too. But pathos isn't something you can just insert when you write. You have to make it believable and real, give it life and ignite it so that it is actually felt rather than just represented. Another relationship poetry has with other forms of literature is the ability to start in medias res or in the midst of the action, rather than always starting at the beginning. Reading: The Little Refugee by Anh Do and Suzanne Do. This week we discussed the use of schemas and scripts in children's books. Schemas are knowledge structures, patterns and associations that we store in our memories. They are often culturally specific. For example, using the text we studied this week, the picture book The Little Refugee, we have the schemas of Vietnam, Australia, boat people, refugees, and multiculturalism, just to name a few. What do you think of when you hear any one of those words? Put simply, that's what a schema is. Readings: The Art of Personal Narrative by V Gornick, Who Stole the Soul of the Boy from Indiana? by P Conrad, and In the Giant Green Cathedral: Malcolm Knox on Tim Winton's Breath and surf writing by M Knox. This week's topic was narrative experiment. This is when the story is not presented as a conventional piece of prose. We ask ourselves how we can complicate and enliven our work and remember that our work does not have to conform to a particular formula. The only thing our work does need is a strong and appropriate narrator. We have to identify what the situation is, what is important about that situation, and what aspects of ourselves will animate the piece by being put into the 'I' character. I apologise if these notes weren't as thorough as they have been in previous weeks. I don't know if it's just me and my suddenly busier-than-usual schedule messing with my head, or if there was just a lot more practical work and less theory and notes taken this week than in previous weeks. Did you learn anything writerly you would like to share this week? I have never read a book that actually made me cry that I can recall. I mean, I've read plenty of books that are sad, and books that have made other people cry when they've read them. I thought The Fault in Our Stars by John Green would be my undoing after the hype about how sad it was that I was told by all my friends and the internet, but sad though it was, I didn't cry. I felt a little traumatised in my Children's Literature class yesterday when we read through Home and Away by John Marsden and Matt Ottley, or when one of my teachers back when I was six years old read Jenny Angel by Margret Wilde and Anne Spudvilas to the class, but I never cried. There are a couple of songs that have made me cry. F**kin' Perfect by P!nk, The A Team by Ed Sheeran, Snuff by Slipknot. Even that list is fairly short, considering how much music I listen to on a daily basis. What have you read, watched, or listened to that has made you cry? It's actually Sunday night here in Australia, as I was visiting my parents over the weekend and did not bring my laptop or my study notes. So sorry if that inconveniences anyone. Here is a summary of my fourth week of classes! Readings: Point of view and voice: 'where I'm calling from' by Jack Hodgins, If on a winter's night a traveler by I Calvino, Girl by Jamacia Kincaid, Man-man by VS Naipaul, True history of the Kelly gang by Peter Carey, White Noise by D DeLillo, and Cold snap by Cate Kennedy. My classes really like talking about point of view. In my fiction class in particular, we were asked to consider how different points of view limit or enhance a story. When you read or writing something, do you ever sit back and think, would this work better in a different point of view? Personally, I was to rewrite my first novel EVERGREEN in first person, as I think it would do better that way than the way it is currently in third person, though third person is my preference. This is something I love about drafting and redrafting a piece of work: just because you started in a certain point of view doesn't mean you're committed to it. When you're redrafting something, you have the perfect opportunity to go back and change things like the point of view you're using. One thing that was said during class discussion resonated with me a bit and I had one of those pleasantly surprised 'huh' moments: third person is just an 'I' that never steps out from behind a chosen mask. This can work with both limited third person, where the 'I'-mask is the character the narration is focused around, and in omniscient third person, where the 'I'-mask would be a god-like voice. Here, I want to make a note on the distinction between two different things people mean when they say 'point of view'. There is point of view as in narration style (first person, third person, etc, as I have been talking about above and last week) and there is point of view as in focalisation, or the lens or character through which the story is told. Readings: Project Papers edited transcript of Ted Berrigan's Sonnet Workshop, The Sonnets: I by Ted Berrigan, The Sonnets: III by Ted Berrigan, Sonnet 1 by William Shakespeare. This was an interesting class. The roll-call question was What would your gnome name be? We spent a good hour talking about gnomes. We wrote poems about gnomes. Somehow, talking about gnomes led to talking about sonnets. The form of sonnets, like many other forms of art, has been changed and adapted over time. Petrarch wrote them in two stanzas, of eight lines and then six lines. When later Shakespeare got a hold of the art form, he reformatted it to four stanzas: four lines in the first three stanzas and two lines in the final stanza. Sonnets are all about the pronouns - the 'you' and the 'I' and the 'we' and the 'they' - and the abstract phrases that describe the dynamic relationship between two things. They also, traditionally, follow the rhythm of iambic pentameter, which is using five couplings of soft and hard sounds per line. Read one of the above sonnets, or another traditionally formatted sonnet, and see how each line reads approximately soft/hard soft/hard soft/hard soft/hard soft/hard like a heartbeat. We ended the class with a brief discussion of dada art, we can be defined as anti-art, pranks against art, or conceptual art, depending on your stance on the matter (or the artistic merrit of the individual piece, if you're like me). Basically, you find something, take it out of its original context and put it into a new context and call it art. This week we were looking at the postmodern fairytale picture book. Having picture story books isn't important to help kids understand what they're reading. The visual representations of the words on the page are rarely limited to their literal meaning, and children are learning to understand image representation and analysis. There can also be a cultural impact on the illustrations. Picture books are transmedia texts, which use more than one medium. In class we analyse how the words and pictures affect each others meaning and the reader's interpretation. We can analyse picture story books with a rage of tools, including the spread (pages), protagonist, frame and layout, colour, shape and lines, style and medium, and composition. We use postmodern techniques to retell fairy tales because we have to reassess the values of the original story for a modern audience. Sometimes, this also means we have to modify the meaning of the story. One of the postmodern techniques often used is intertextuality: when the text refers to other texts and the reference plus the relationship between the two texts add meaning to the new text. Parody is another technique, which can include intertextuality. The Shrek movies are a great example of both parody and intertextuality. Another technique sometimes used is metafiction, where the text openly comments on its own fictional status and/or the character are aware that they are not real. Postmodern texts draw attention to how stories are created and told, how narrative fictions are constructed out of other texts, how stories encode and transmit cultural values, assumptions and ideologies, and the relationship between fiction and reality. Readings: Taking Shape by S Perl and M Schwartz, Joe Cinque's consolation: a true story of death, grief and the law by H Garner, and Subterranean Gothic by P Theroux. We were talking about narrative structure this week. There are a few different ways in which we can order the stories we tell. This includes forms such as chronological, segmented, framed, compare and construct, multiple perspectives, episodic, Q&A, epistolary, multigenre, and inverted pyramid. Every story needs a shape, and often that shape isn't clear when we start out writing our first draft. Sometimes it doesn't start to form at all until we are at the stage of redrafting. That is another thing I find beautiful about writing and drafting and redrafting; the shape, or lack thereof, is something you can go back and change. Other times, the structure of the piece you want to write will precede the story and content itself. If you are having trouble finding a shape after you have completed a first draft, some of the things you can do is go through and star your favourite parts and see if you can find a connection between them, look for the narrative arc of the overall piece, and look beyond that first line in case there is a better place for you to start. Something creative nonfiction pieces need is scene, summary and reflection. Checking to see if you tick all these boxes can also help you find the shape. Avoid second-hand telling, ground your writing in the particulars, don't be superfluous, bring something new to the story. Don't be afraid to go on riffs and tangent as long as you bring it back to the point of the story (and don't part from the main story for so long that the reader forgets). Alright my petals, my Sunday-night brain is kicking in after a long weekend of doing-too-much-but-not-really-all-that-much. Visiting the hometown just zaps the energy from me and my assignments and the deadline for submissions to the next edition of Wordly Magazine (of which I am now a member of the production team) are looming. I am going to go and cram some readings for tomorrow mornings classes and then try to be in bed before midnight. Have you learned anything writerly this week that you would like to share?